"Everything is unprecedented until it happens for the first time." That's an excellent quote from Tom Hanks in Sully, a brilliantly constructed masterpiece. The film is based on the book Highest Duty by Chesley "Sully" Sullenberger & Jeffrey Zaslow. Hanks portrays Capt. Chesley "Sully" Sullenberger, an airline captain, who flew US Airways Flight 1549 on Thursday, January 15, 2009, en route from LaGuardia Airport in New York to Charlotte Douglas International Airport in Charlotte, with direct service to Seattle-Tacoma International Airport in Seattle. However, about 3 minutes into the flight, the plane hit a flock of Canadian geese, crippling both engines. With no power, & unable to return to LaGuardia, or make an emergency landing at either Newark Liberty International Airport in Newark, New Jersey, or at Teterboro Airport in Teterboro, New Jersey, Sullenberger, along with First Officer Jeffrey Skiles (played by Aaron Eckhart), decides to make an emergency landing in the unbearably cold Hudson River. 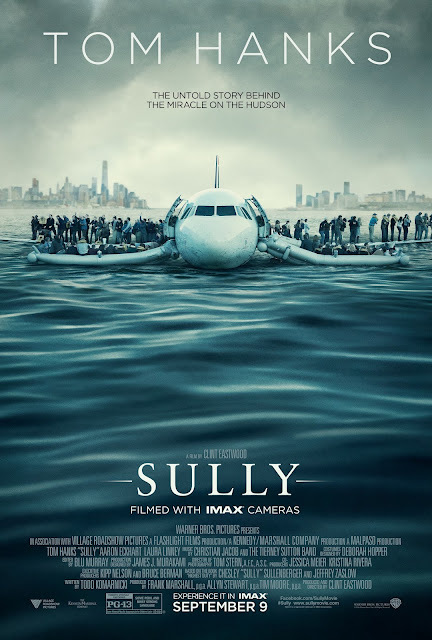 Against all odds, Sullenberger succesfully ditches the plane in the river, with all 155 people on board surviving, with several minor injuries, & only a few serious injuries. Sullenberger is hailed as a hero by the press & civilians. However, the National Transportation Safety Board's inquiries indicate that the left engine was still usable, giving the plane enough power to land at LaGuardia or Teterboro. Sullenberger & Skiles, both believing that isn't true, must now convince the board to take a second look at the landing. Hanks & Eckhart's performances were excellent, with Hanks' performance being one of the 10 best of his career, & Eckhart's performance being one of his 3 best performances, along with 1997's In the Company of Men, & 2006's Thank You for Smoking. Clint Eastwood's direction is amazing, with this being one of his best films of the century. Todd Komarnicki's screenplay is great, along with the editing from Blu Murray. The cinematography from Tom Stern is amazing. And the visual effects, especially the visual effects during the flight scene, are absolutely astounding. This is definitely one of the year's best films.